With the possible exception of Gene Kelly or the seriously depressed, does anyone really enjoy schlepping out on a cold depressing day? Since we can't control the weather why not come up with something to put a smile on our faces. KNIRPS, a leading umbrella manufacturer has just come up with the perfect solution ....ta da! 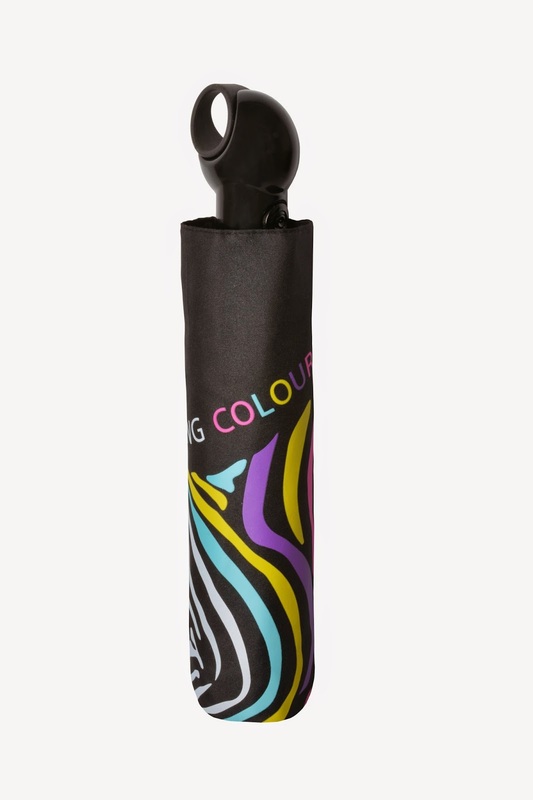 Welcome to the world of" FLOYD" with their new FLOYD WET, a black umbrella with a white zebra pattern. This umbrella is light weight in design and features a ring handle. "He was such an unassuming umbrella," said Floyd's neighbors. Here's the good part.....when the white zebra pattern gets wet the lines change into bright colors. "But when it rained, he turned wild." How cool is that? At $39 retail this is something to sing about. For more info go to www.Knirps-USA.com. Stay dry until next time, C&C.